We use this drill as both an offensive and defensive drill. Defenders try to stop the offense 1-on-1. The offensive player attacks and tries to beat his/her man 1-on-1. In this drill, each player has a partner (opponent) that he/she goes 1-on-1 against. Each pair has a ball. Use both ends of the court. The player with the ball starts at the top of the key and tries to make a move, or shoot the outside shot and score on the defender. The defender must stop the offense, box-out and get the rebound. The offense gets a point for (1) each basket made, (2) for each offensive rebound and (3) if the defender fouls. No second shots are allowed. Each pair keeps track of their score. Have post players paired up with post players, and guards paired up with guards. Play to 5 (each player gets five offensive attempts). At the end, the losers do 5-10 push-ups. This drills works both offense and defense, ball-handling, dribbling, scoring, defense, conditioning and toughness. See the diagrams below. In diagram A, we begin with offense-defense 1-on-1 starting on the sideline. The offensive player O1 tries to dribble around the defender to the opposite sideline in 5 seconds or less. Players must stay within the blue-line/half-court line area. If O1 successfully reaches the opposite side within 5 seconds, then both players go to the second part of the drill. If the defender contains O1 within 5 seconds, the defense wins, the drill is done, and the next two players start. 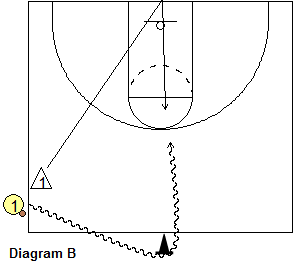 If O1 reaches the sideline within 5 seconds, the second part of the drill starts (diagram B). X1 sprints to the rim and then closes-out out towards the top of the key. O1 speed dribbles around the cone at half-court, and then attacks the defender 1-on-1, making a dribble move and attempting to score. X1 tries to stop the move, blocks-out and rebounds, and the drill is finished. Break your team into groups of 3, 4 or more players. You can score each set by either made baskets or defensive stops, or both. Losers either run or do push-ups. This offensive drill helps players read the defense in a 2 on 1 situation, and helps them to learn when to take it to the hoop or pass off to their teammate. Make two lines, one with perimeter players out at half court on the left sideline. The other line is made up of your post players, and is opposite along the right baseline. There is a token defender (maybe a manager or an assistant) on the guards. One of your post players is the other defender in the paint area and will try to stop the 2 on 1 break. Player #1 has the ball, makes a fake or jab step, and goes around the token defender. He/she then dribbles toward the hoop, and tries to exploit the 2-on-1 situation with the defender. The first player in the post line along the baseline is his/her teammate. The guard has to decide whether to take it to the hoop, stop and pop a jumper, or pass off to his/her teammate. He/she should try to get the defender to commit. If the defender comes up, he/she should pass to the post player. The post player should maintain proper spacing and take it strong to the hoop and lay it in off the glass (or slam dunk it). If the defender lays back, the guard should take it to the hoop. 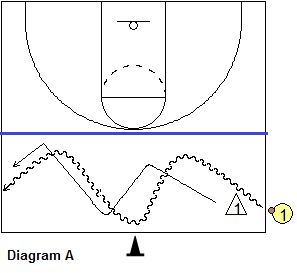 In this drill, discourage the outside jumper. The offense should try to get a lay-up every time. The rotation is that #1 now starts a new line on the right sideline (see the diagram). #2 starts a new post line along the left baseline. Use the same defender until all the post players have been on offense, then use another post player as the defender.